This tool requires you to enable a developer mode in your browser, giving you access to extra functionality. But as the saying goes, "with great power, comes great responsibility," so the risk you take in trying out this feature is your own. Once you have the file, unzip it on your desktop or wherever you like to put unzipped files. In my tests, my computer's archive manager unzipped the extension as a set of files without a folder. But for this trick to work you need all the files contained in their own folder. So if you end up with a bunch of loose files just create a new folder with the name of the extension and put all the downloaded files into your new folder. Keep in mind the extension folder has to be placed in a permanent location so that Chrome can find it each time it loads the browser. For the final phase, you have to open up Chrome's extension settings, which you can get to quickly by typing "chrome://settings/extensions" into Chrome's address bar. At the top right of the page, check the "Developer mode" checkbox, which allows you to load your own extensions. Then click the "Load unpacked extension" button at the top of the page. In the new window that opens select the extension folder you created in the last step. Your browser should now be loaded with your new extension and you can give it a try. I also found the conversion tool didn't perfectly convert all bookmarklets such as the recently released Don't Be Evil bookmarklet that modifies Google's Search Plus Your World results. But for simple Web clipping services the tool should work just fine. 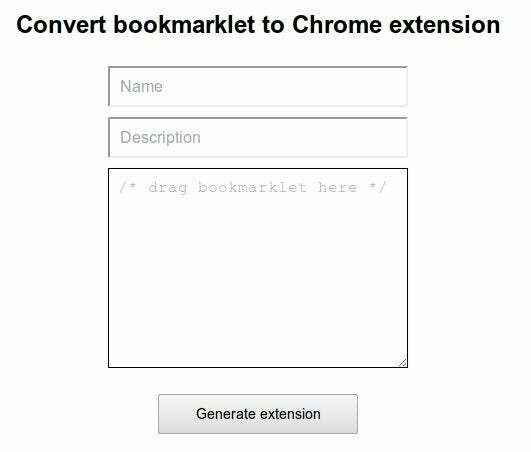 It's not clear whether this online conversion tool will be around forever, but if you want to get rid of your bookmarklets in favor of a Chrome extension give it a try. And if you're a developer type, Legierski has made the source code for his bookmarklet conversion tool available for download.